The week before Thanksgiving is usually a busy week in corporate video production. A lot of companies want to squeeze in their fourth quarter video marketing projects before the end of the year. ASL Productions’ week followed that trend. We stayed moving with three shoots on location and our post-production team busy in the office. There was a lot of travel, gear set up, and projects in the works. Here is a look back at ASL Productions’ week from November 16th through November 20th. 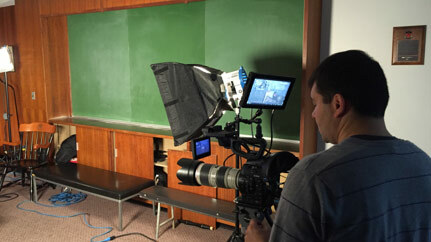 Our week, at ASL, started with a shoot for American Sports Network at Fordham University. In our research of the schools and conferences that ASN covers, we found a story about Mandell Thomas. Mandell is a senior defensive standout, on a Fordham squad trying to keep pace with the increasingly competitive A-10 conference. Entering the 2015-2016 season with a new head coach, Jeff Neubauer, and a more aggressive defensive philosophy, Mandell could lead the nation in steals in his senior season. 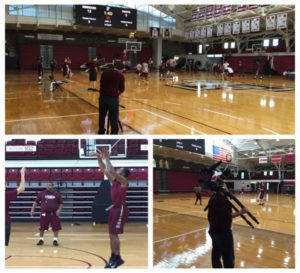 Our interview took place at Fordham’s Rose Hill gym. We filmed their practice before the interview to get b-roll of Mandell and Coach Neubauer, both of whom we would be interviewing. Our lighting setup included a Kino Flo Diva as the key, an Arri 650 with Chimera softbox for fill, and Arri 650 and 300 back-lights. Our sound set up was pretty simple. We used a boom mic that was elevated on a c-stand and a lav mic attached to the shirt of Mandell and Coach Neubauer. 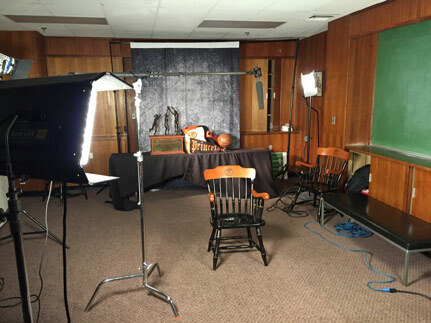 It was very cool shooting these interviews in the historic Rose Hill Gym and both Mandell and Coach gave great interviews with sound bites that will help define our story. Our first story focused on Annie Tarakchian, senior leader and US Basketball invitee. Annie has many interesting storylines both on and off the court. We decided to hone our story on a frank conversation between coach and player that helped transform Annie into the player she is today. Our second story was about Peter Miller, a junior center poised for a breakout season. Along with Tarakchian and Miller, we also interviews both of their coaches, Courtney Baghart and Mitch Henderson. It was easy to see the love and respect each coach had for their players. One main difference in the Princeton interviews, as opposed to the Fordham interviews, was that we used props that added production value to the piece. We used a basketball, a few Princeton sweaters, and a pennant and placed them in the background. While it doesn’t seem like that would add a lot to an interview shoot, little details like that create an aesthetic that make our video productions stand out. Our ASN video interviews for the week were over but we still had one more important production to shoot. On Thursday, ASL traveled to Baltimore to produce a panel discussion for the American Journal of Managed Care. We filmed and recorded the four-person panel discussion while cutting to each speaker live. We inserted AJMC’s graphic over the green screen wall and provided a teleprompter for the moderator to know when to come in and out of the discussion. We took advantage of a desk we had built for a previous shoot at the same studio. We filmed with four Canon C300 cameras to cover all angles of the panel discussion. The studio had a track lighting system that we took full advantage of. We evenly lit the green screen, so keying it out was simple. We keyed our subjects with Kino Flo’s that were hanging from the track an able to be dimmed. We made sure to position our key lights to avoid harsh shadows falling onto the news desk in front of our subjects. To provide some separation between our panelists and the background graphic, each person was hit with a leko back light. The leko’s are great for spotting a particular area of light such as the top of a shoulder or head. Proper backlight helps make videos look 3 dimensional, separating subjects from their backgrounds.